When you take 50 years of toughness, and combine it with the most advanced tech and safety features available, you get the new 2018 Toyota Tacoma. For a rugged compact truck that’s as capable on the pavement as it is off road, test-drive the 2018 Tacoma at Toyota of Tampa Bay! Built with high-strength steel, the new Toyota Tacoma benefits from a 2.7L 4-cylinder engine. For more power, move up to the Atkinson-cycle 3.5L V6, featuring Toyota’s D4S combination of direct and port fuel injection, giving the Tacoma up to 278 horsepower and 265 lb.-ft. of torque. Both engines work in tandem with Toyota’s 6-speed automatic transmission for a smoother, more powerful drive. Plus, with the available Tow Package, the 2018 Tacoma can tow up to 6,800 pounds or carry a payload of up to 1,440 pounds. The 2018 Toyota Tacoma impresses with its chiseled lines and aggressive grille. Its cabin will keep you cool, calm, and collected over any terrain, even in Florida’s most extreme weather conditions. Whether you’re driving the streets of Tampa Bay or heading out of the city to the road less traveled, the Tacoma matches muscular performance outside with superior comfort inside. When it’s time to go to work, the new Toyota Tacoma makes the job easier with a composite bed, an innovative deck rail system with 4 heavy duty tie-down cleats, a smart in-bed storage compartment and available 120v power outlet. Plus, when you head off road, the 2018 Tacoma’s available Crawl Control and multi-terrain select helps improve traction and mobility. No matter how tough the terrain, the new Toyota Tacoma in Tampa keeps you comfortable and connected to the world around you. You can also drive in safety with Toyota’s Star Safety System, featuring Blind Spot Monitor and Lane Departure Warnings as well as active headrests, tire pressure monitor and daytime running lights. 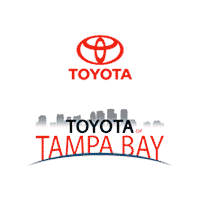 If you’re looking for more comfort, power and technology on and off the roads of Florida, choose the 2018 Toyota Tacoma at Toyota of Tampa Bay, serving Tampa, Brandon and Wesley Chapel. Check out our huge selection of new Toyota models and used vehicles, and ask us about our special offers and easy financing options on new cars, crossovers, SUVs and hybrids! Super White 2019 Toyota Tacoma SR 4WD 6-Speed Automatic 2.7L I4 DOHC 16V 4WD. Recent Arrival!